The Lyndon Baines Johnson National Historic Park and the LBJ Museum of San Marcos teamed up November 5th to honor Veterans with their joint entry in the San Marcos Veterans Day Parade. 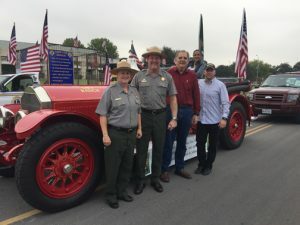 LBJ National Historic Park Superintendent Russ Whitlock and Ranger Susanne Corlett brought the park’s 1915 American LaFrance fire truck to San Marcos for the parade. Joining them on the fire truck were LBJ Museum Board members Ed Mihalkanin, John McCrocklin, Melissa Millecam and museum staff Ralph Garcia and Crissy Campos. Ranger Corlett and T.J. Clement, West Point Graduates of the Class of 1997, honored classmate LTC Jaimie E. Leonard who was killed on 8th June 2013 while serving in Afghanistan with the dedication of a tree in LTC Leonard’s memory.. The fire truck once served the town of Brady, TX and was given to President Johnson in 1965 by the Brady Fire Department. The historic fire truck has been restored to its original glory when it was donated to President Johnson in 1965. When it was new it carried 1200 feet of standard fire hose and could deliver 1000 gallons of water per minute at any pressure desired up to 400 pounds per square inch. It is electrically equipped throughout, having lights near each gauge on the pump and around the motor, as well as an electric starter. The Hercules motor is a six cylinder and provides 105 horsepower. 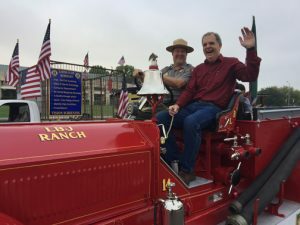 SALUTING VETERANS: LBJ National Historic Park Superintendent Russ Whitlock and LBJ Museum Vice President John McCrocklin steer the classic 1915 LaFrance fire truck in the San Marcos Veterans Day Parade. Teaming up for the Veterans Day Parade in San Marcos were Susanne Corlett, Russ Whitlock, John McCrocklin, Crissy Campos and T.J. Clement on the LBJ National Historic Park’s 1915 American LaFrance fire truck.